Built in 2012 by Arnold Graton and Associates. 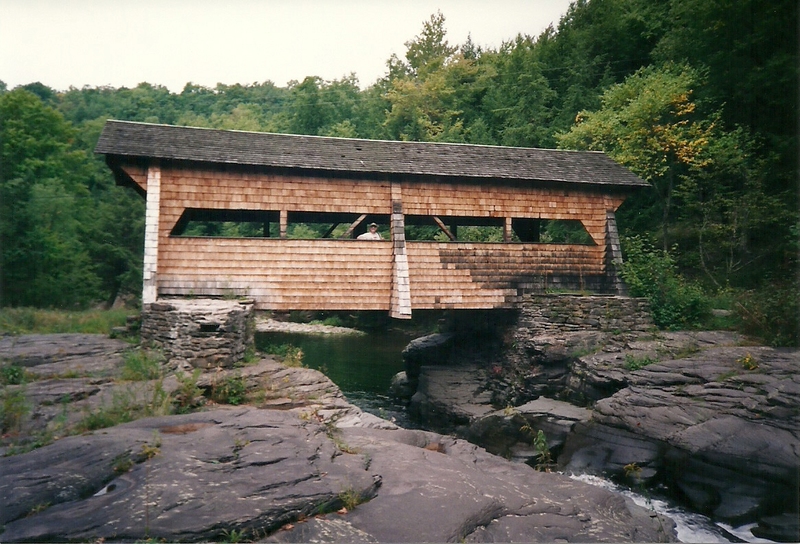 A single span of 40′ crossing Mill Brook. 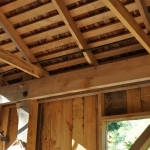 Displays a Kingpost truss. 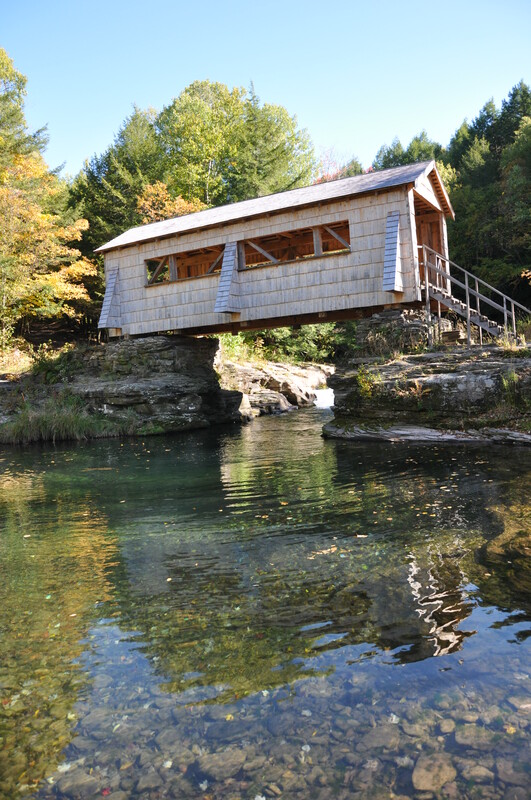 This is a private bridge and visitors are not allowed. 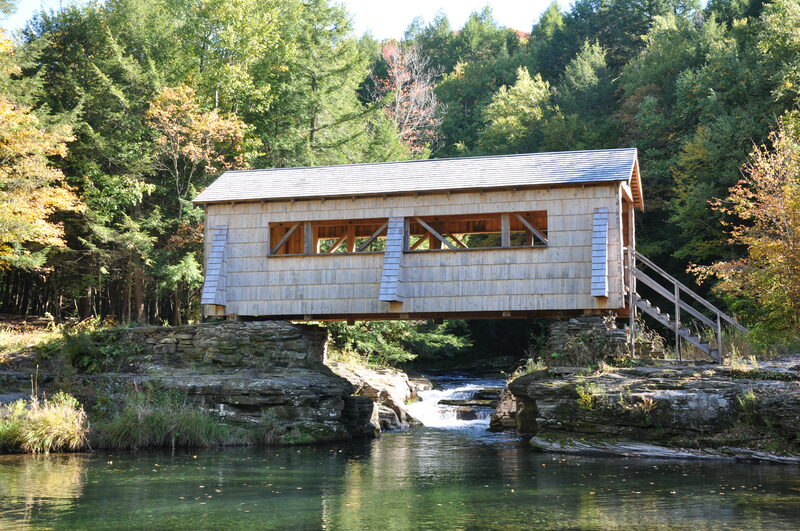 The Tuscarora Club Bridge is a private bridge, please do not trespass! They usually DO NOT grant permission to visit. Illegal trespassers will be dealt with accordingly. 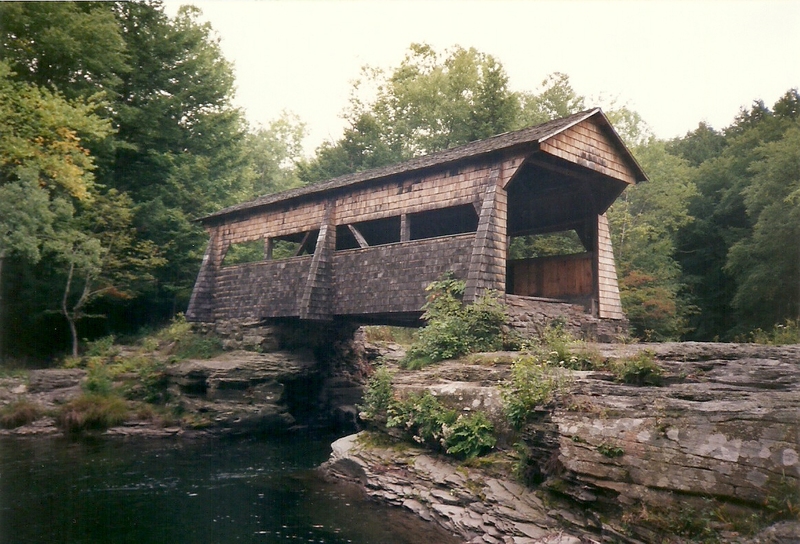 The bridge was originally built in Dunraven, NY in 1870 by William Mead. 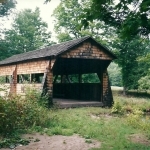 Due to the move and many changes to the bridge, it does NOT qualify for being registered on the National Register of Historic Places. 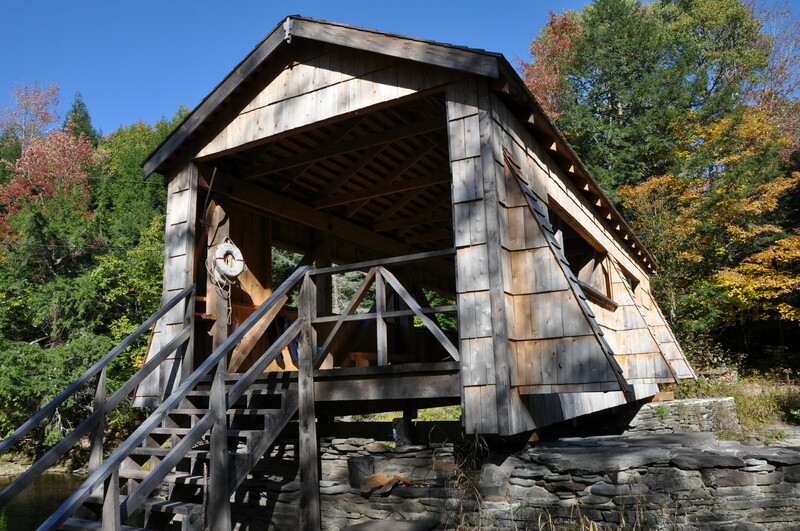 It was moved to the club grounds in 1935, saving it from the bottom of Pepacton Reservoir. 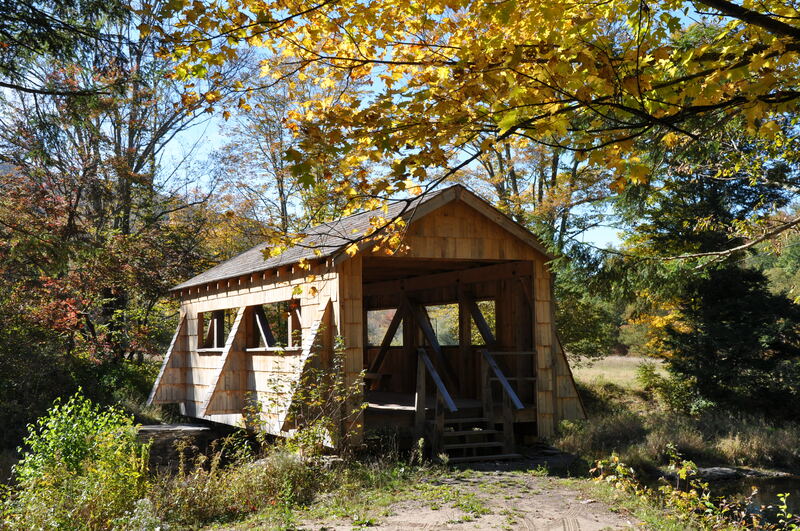 The bridge, in its present form, is a single span of 38 feet built of King Post truss over the Mill Brook. 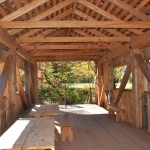 It is located in the Town of Middletown, south of Margaretville. 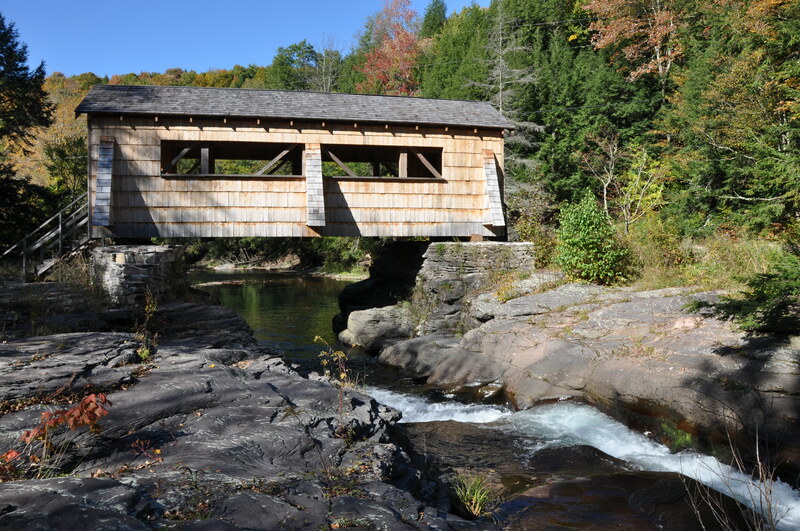 The original Tuscarora Covered Bridge on this site was washed away during Tropical Storm Irene in August of 2011. 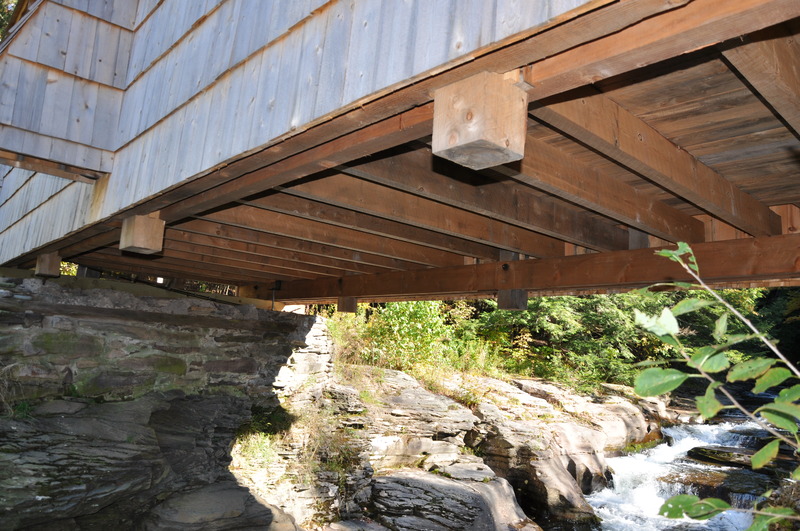 The bridge that stands here today was built in 2012 by Arnold Graton and Associates of New Hampshire. 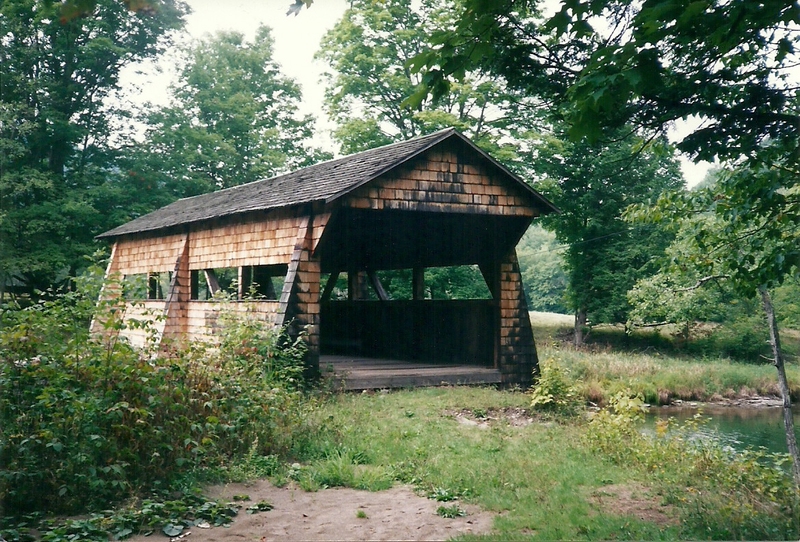 The 40-foot-long Tuscarora Covered Bridge is one of six covered bridges still standing in Delaware County. 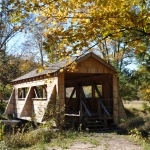 It is maintained by the owner and carries pedestrian traffic across Mill Brook. 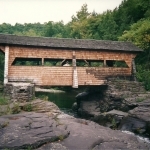 It is one of three Kingpost covered bridges in New York State. 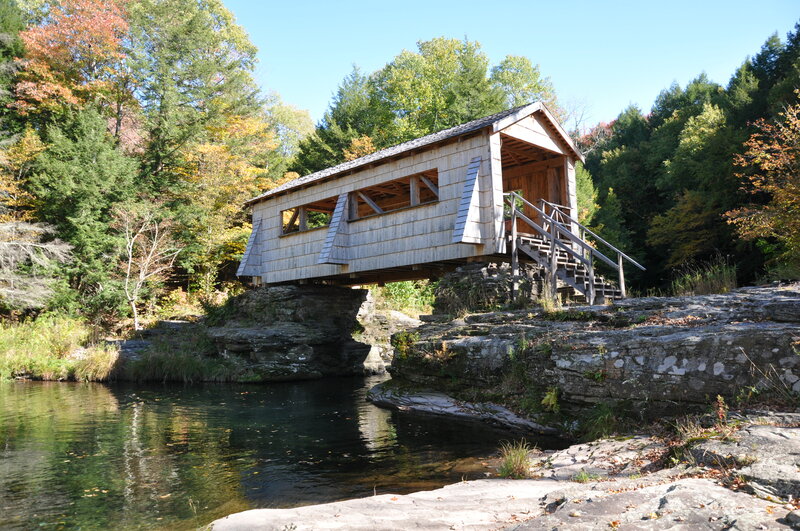 It is very similar in dimensions and design to other bridges in the Catskill region, all of which feature buttresses. 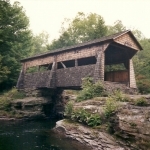 The Tuscarora Covered Bridge has three such buttresses on each side. 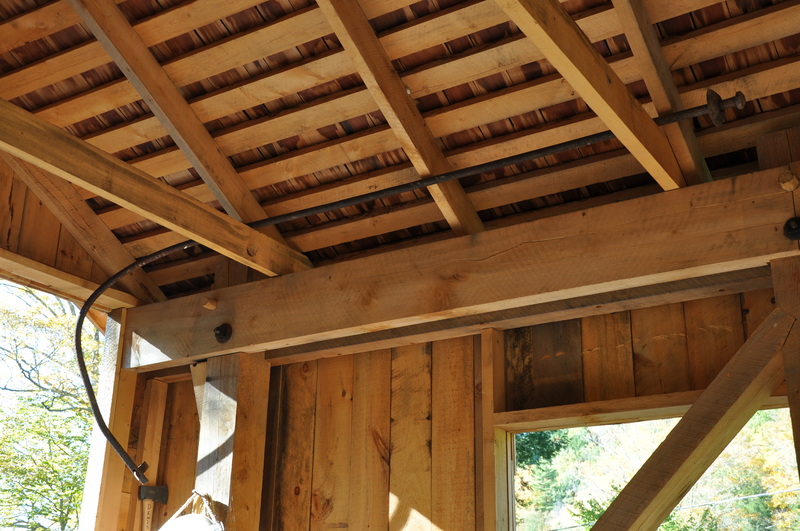 One interesting feature of this bridge is that the bridge is completely shingled. 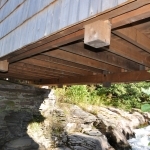 This is the only covered bridge in New York State that incorporates cedar shingles as siding for the bridge. 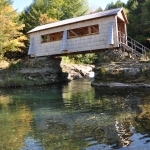 This bridge is privately only and not open to visitors. Please respect the no trespassing signs posted on the property. 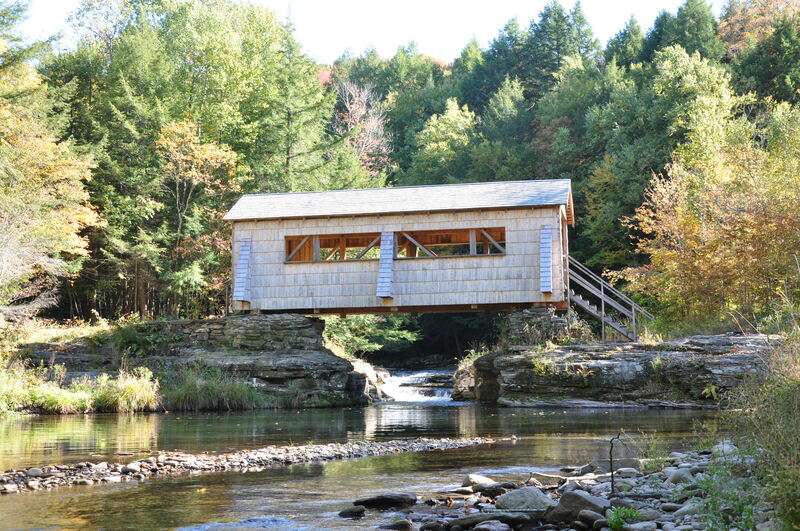 The original Tuscarora Covered Bridge on this site was washed away during Tropical Storm Irene in August of 2011. 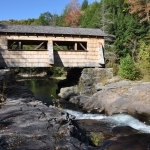 The bridge that stands here today is a totally new bridge built in 2012 by Arnold Graton and Associates of New Hampshire. 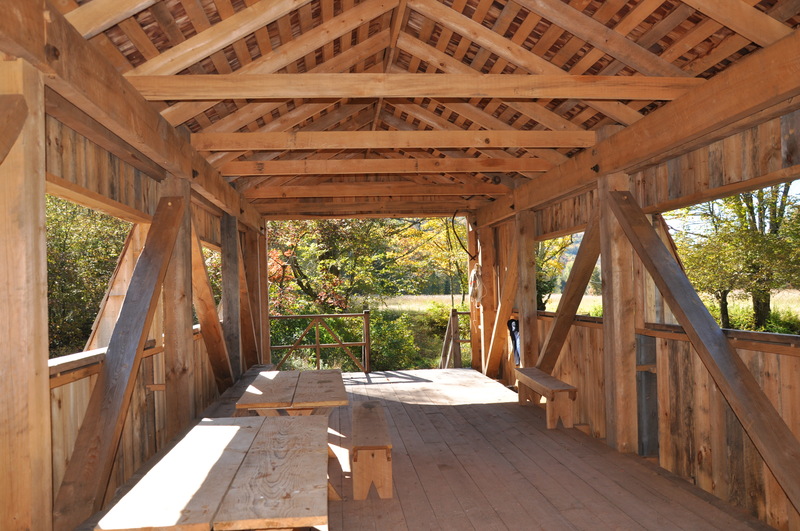 Please note that visitors are not welcome as you will see by the no trespassing signs. Trespass at your own risk. 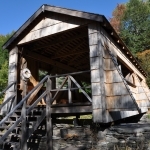 From Margaretville on State Route 28 & 30, go west 2.2 miles, then left onto County Road along the Pepacton Reservoir for just over 1/2 mile, then left on Mill Brook Road for 2 miles. Park at telephone pole #32/125 and walk down to the bridge, IF you have permission!! !